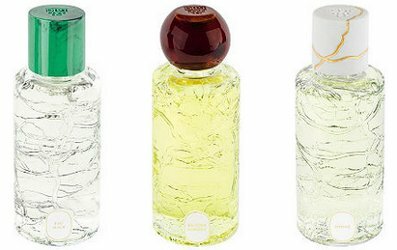 Diptyque has launched (and/or reissued) three new fragrances in their La Collection 34 series: Eau Mage, Ôponé and Benjoin Bohème. Collection 34 welcomes a trio of eau de parfums, amazing compositions in special bottles. Unique and irresistible, they will whisper a thousand stories on the skin. Ôponé ~ "Turkish rose, Safran, cumin and guaiac wood - A flower warmed with a hint of saffron, a little cumin and guaiac wood with leather, smoke and liquorice accents, bearing the name of an African port on the Spice Route." (The original Olivia Giacobetti composition was released in 2001, and later discontinued). Benjoin Bohème ~ "Laotian benjamin, angelica seed, sandalwood, styrax and patchouli - Benjoin Bohème is an elegant balm. Accompanied by angelica seeds, sandalwood, styrax and patchouli, this Laotian ingredient becomes much less indiscreet. It will whisper a thousand stories on the skin." Diptyque Eau Mage, Ôponé and Benjoin Bohème are $200 each for 100 ml Eau de Parfum. They are listed on the US Diptyque website as "boutique exclusives" but are distributed in retail stores elsewhere (Selfridges in the UK has them, presumably among others). Well, surprisingly enough, I would like to get a whiff of all three. I did not love Opone (but know many people did!) or Eau Mage, but would like to get my hands on that benzoin. Ditto that!! Esp. the Benjoin Boheme!!! Love those bottles. Eau Mage is an excellent scent, one of the most complimented I used so far, still have the limited edition. Opone doesn’t really tickles my fancy but Benzoin Boheme sounds lush. I think EM was an Eau de Toilette? So maybe this will be a tad deeper, who knows. True, it was an eau toilet Robin. So, I tried the new version of Eau Mage, still a beautiful scent with the rose oxide toned down quite significantly, giving space to the mandarin-cumin-ambroxan combo. Dry, a bit austere and very modern, it has a very urban feeling through out it’s development. I loved Benjoin Boheme, done in a Volutes way only much less sweet. But most importantly, it reminds me of a far more civilised and well behaved Tom of Finland:) It’s already in my wish list, I’ll wear it when I visit mum, last time I was wearing Tom of Finland and she asked me not to bring with me that weird person next time around..
Oh good to hear, thanks! I must go try them. For some reason “they will whisper a thousand stories on the skin” is very funny to me. I actually dig the bottles, though, and wouldn’t mind trying all three! I LOVED Opone, and even had a back-up bottle (which is now gone). It was a saffron-rose to me….adored it. The other two sound interesting as well. Altho Ambroxan and I generally aren’t friends… Benjoin sounds promising. NOT liking the bottles. Hoping they’ll look much better in person. The Benjoin one sounds interesting. The other 2 don’t interest me at all. They seem overpriced also. Annoying! I have very good luck with Diptyque scents, I’m very interested in trying the Ôponé and Benjoin Bohème.